One of the best books I have read on the topic of culture is the classic by Bolman and Deal – Reframing the Organisation. In this book they discuss that culture is a product of the myths, rituals and ceremonies within the organisation. Myths include stories of past exploits. Rituals are the ‘things’ done on a daily or weekly basis that are unique to that organisation or department. Ceremonies are the bigger activities, performed on a less frequent basis. A bit like making your partner tea in the morning (a ritual) and going out for a celebration on your wedding anniversary (a ceremony). Rituals and ceremonies help define your marriage. Then there are additional contributing factors such as theatre: this is the physical stage-setting in which business is carried out. The impression you get when you walk into a business reception, and further into the working environment is always a good indicator of the culture of the business. Staff also pick up on these non verbal cues and begin to behave accordingly. A more traditional definition of culture is: ‘the way we do things around here’. This is a valid definition, but too simplistic. My preference is to see this simplistic definition – the way we do things around here – as the product of the myths, ceremonies, rituals, etc of the company. Recognising the contributing factors for what they are provides you with the levers you need to influence or change the culture. Over the last 20 years or so, my consulting has broadly focused on performance improvement and business transformation. Having said that, it is also worth noting that for nearly all the clients I have worked with and for all the projects I have completed, the vast majority have benefited from an improvement in performance but very few clients have truly transformed themselves. In my experience, business transformation cannot be achieved without a substantial challenge to the prevailing culture. But as with all improvement projects, to change the status quo requires that you understand what the status quo is. Or, in consulting speak, understand the ‘As Is’ and then define and move to the ‘To Be’. Understanding the current culture in an organisation is readily achieved through the administration of a survey or organisational diagnostic tool. I have used a few and found that most of them use a foundation model against which the survey results are modelled. For example, the Roger Harrison diagnostic identifies four organisation types; Power, Role, Achievement and Support. The diagnostic then indicates which type the organisation is more closely matched to. There is nothing wrong with this approach. Having a foundation model is good place to start, but it is important to validate that conceptually the model represents your organisation. If you disagree with the idea of restricting your organisation to Harrison’s four types, then his diagnostic is not suitable for your company. Executives know that the culture is in some way a reflection of them, and it is possible that they could reject any foundation model that doesn’t broadly align to their view of the organisational culture, or what the culture should be. Using the Harrison example, a CEO may privately support a Power culture, but publically espouse a Support culture and therefore will not use the Harrison diagnostic as it may expose his private views. There is no easy way to mitigate this besides working with executives to help them accept that when it comes to the ‘As Is’ there is no right or wrong answer. All modern diagnostics should broadly give you the same answer, and recognition and understanding is substantially more important than how the result is labelled. Equally important is the level of detail provided. What you don’t want is really fine detail as each person in the organisation will have their own interpretation of what the culture is and what it means to them. And an individual’s interpretation of the culture is heavily influenced by their own personal circumstances and views on life. It is easy for a person to pick out the few aspects of the culture that supports their behaviour and ignore the multitude of other cues that challenge it. Given this, changing the culture at the individual level is a very long game and likely to yield a very poor result. What is important is to fully understand how the perceived current culture is influencing the behaviour of groups of people, since different groups may have different interpretations of the organisational culture. Everyone considers themselves part of the business, but acts in accordance with their ‘local’ culture. It is similar to there being different dialects of English between towns and villages. They all identify themselves as English, but at the detail level, they acknowledge and celebrate the differences. While this may seem simplistic, it does get more complex as you examine the two environments. The primary region of interest represents the point at which the politics of the four drivers are most in harmony and this becomes the prevailing culture of the company. Leadership and Management style is often the same thing at the CEO level. As soon as you move down the hierarchy they separate and leadership may become less of a factor, and management style can start to dominate. The more senior the role, the greater the influence an individual’s management style has on the culture of the company. It is not hard to accept that a supervisor may create a micro culture within their area of control and that this would not have significant influence on the culture of the organisation. On the other end of the spectrum, the management style of the senior executive of the company will have significant influence on the company culture. If their style is to be cautious and to enforce detailed analysis into the decision making process, then this will create a very different culture to the company where the senior executive actively empowers and enables his managers and is willing to make decisions on 60% of the facts. The influence of Leadership on the organisational culture is enormous. My view is that just because a company has a ‘leader’ (Managing Director, CEO, Owner etc), does not mean they have leadership. For me, leadership is the capability to engage the hearts and minds of people and cause them to emotionally invest and believe in a vision for the future. Leadership can therefore manifest itself at any level in the organisation. The higher up the organisation, the more it will influence the culture. It is therefore true you can have great managers who are poor leaders and vice versa. Depending on whether the CEO’s strength is in leadership or management will significantly influence the culture of the organisation. 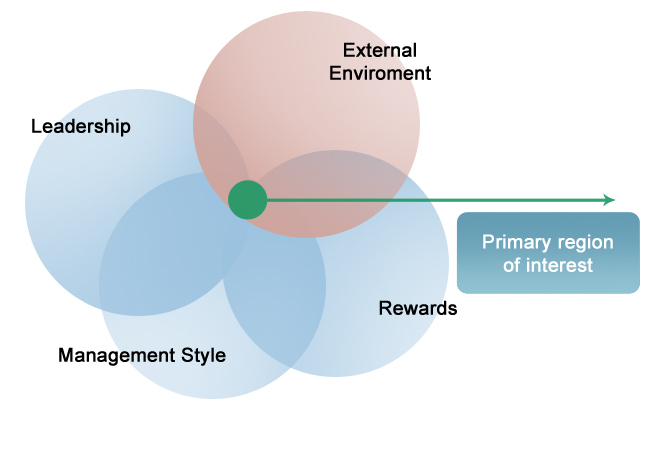 Rewards are the third arm of the internal environment and I consider them to be as equally important as the management and leadership arms. The salient point is that rewards refer to the receipt of the reward, not the giving. This means that for any given individual, rewards can be intrinsic and extrinsic. Intrinsic reward is the reward that a person bestows on themselves for the job they are doing. Using stereotypes as an example, a charity worker is more likely to frame the work they do in a way that allows them to see themselves as giving back to society. If they were in it for the money then it is unlikely that they would last, as charities never have enough money and the motivation is wrong. Rather they need their internal reward system to provide the self value needed to continue. By comparison, a hardnosed businessperson is less likely to rely on their internal reward system for recognition, choosing rather to measure themselves by the external rewards they receive for the work they do. In this case, reward = recognition and the most obvious examples are salary, car, office and title. There is a maxim that says “Tell me how you are measured and I will show you how you behave”. For the purposes of this paper I will take poetic licence and equate measure with reward; “Tell me how you are rewarded and I will show you how you behave”. Behaviour and culture are inextricably linked. The simple, earlier definition company culture – the way we do things around here – can also be defined as ‘the way we behave as a company’. If the reward is money and materialistic gain, then the culture will have an orientation of achievement and power. If the reward is self fulfilment and non materialistic gain, then the culture will orientate towards humanistic and self sacrifice. The external environment is normally beyond the control of the company and its staff. There are a few cases such as Jack Welsh, Bill Gates, Steve Jobs etc, where the person has influenced the external environment. The influence of the external environment is a product of the mix of global and local legislation, speed of transactions, size of transactions, average age of decision makers, national identity and the social impact of getting it wrong. To explain speed and size of transactions, consider a currency trader. They can place trades in billions of dollars and are ‘in and out’ of the market in 20 minutes. Dealing with those sorts of sums has to distort the way the trader sees the world. A loss of $10million is quickly shrugged off – it was only $10million after all. To survive and flourish in this environment requires a very specific type of personality. My experience is that they work in a culture that encourages staff to play and work hard. Long hours in the pub are not unusual, and to fit into the team a person would need to embrace this aspect of the corporate culture. The national culture will have a strong effect on the organisational culture. To use a few stereotypes; Western culture is founded on freedoms, equality and rights particularly at the individual level. The national culture is generally one of success, and businesses are built in the same mould. The outlook tends to be financially driven and the short to medium term is emphasised. Eastern culture appears very different to me. There is an equal determination to be successful, but with a much stronger focus on the community and with deep respect for history. Profit is important but over the medium to long term. The expectations of society of its citizens will have a substantial influence on how people think and behave at work and, by extension, a strong influence on the organisational culture of the businesses within that society. The question now arises – how do you set or change the culture. Changing the organisational culture is exceptionally difficult as it requires changing behaviour. Let’s say the ‘As Is’ survey has defined the current culture. The next step is to define the desired culture. How does the leader wish the company to behave? Closing the gap becomes the challenge. This list is for example only. Each company should come up with their own list of drivers for their desired culture. A good place to start is the result of how they measure the current culture. Determine what aspects of the existing organisational theatre, rituals and ceremonies are reinforcing the current culture and then consider how they could be challenged and reinterpreted. It is however relevant to ask: should the company change the culture? In certain organisations the culture is widely known and accepted – for example in the military, and the mines. Both these working environments have a very strict culture of ‘do what you are told’, as this culture is vital to the safety of the ‘employee’. For example I once witnessed a small underground rock fall. The rocks landed on a miner’s ankles breaking the bones. The poor man was in a lot of pain and was taken away for medical assistance. Concurrently a charge sheet was written up against him as he should have made the working environment safe before entering. This work practice was not negotiable and his tardiness in this matter resulted in him having broken bones and a date with the in-house judiciary once he was out of hospital. I asked if the broken bones were enough punishment and was told – absolutely not. There is no room to question instructions given underground. Google and Facebook are companies that appear to be on the other end of the spectrum. In each, the rules of the traditional working culture have been significantly challenged. From a theatre point of view, staff can dress largely as they please, work stations/work areas are less proletariat in their nature and layout. Creativity is strongly encouraged. As companies whose success relies on leading the market, they cannot afford to have a culture that inhibits creativity. Once the new culture is defined; all that you really have is a document describing an organisation that is similar but different to your current one. To implement this new culture and take it to a point where the employees use it to drive their behaviour takes substantial effort and frequently some very physical changes. The easiest thing to physically change is the organisation chart. This may be as simple as title changes or a dramatic as changes to reporting lines. Each change sends a different message to the staff. Another changes that are equally dramatic – but slightly more effort – is changing the physical working environment. One of my clients recently changed from a traditional workstation environment to an activity-based working environment where no one has a set desk, or telephone. There are no desktop computers and desks are tidied every night. Each person has a locker for their papers. The move was expensive but the message was blunt. We are going to do things differently from now on. The initial change here was a dramatic change to the theatre. As a result, staff were forced to change their behaviours, and new ceremonies and rituals were introduced. Legacy behaviour from the previous work environment was seen to be obstructive. While my client did not necessarily set out to change the culture, they did achieve a positive change through a dramatic change to their theatre. The problem is that no matter how much you change the theatre in which the play is delivered, if you keep using the same actors, you may soon be getting the same performance quality as before. A complex change is changing the actual staff members. I subscribe to the maxim that says – “if you can’t change the people; change the people”. Moving a key person sideways or out of the organisation is a clear message of the intent to establish a new way of doing things. It also ensures that the company does not slide back to the old way of doing things. While I agree that the company will always have an overarching culture, it is also expected that once the company has migrated to the new culture, each department will have its own interpretation of the new culture, based on the function of the department and the personality of the departmental manager. Consider: the new company culture is to delight the customer and senior managers now dress in corporate casual and have increased expense accounts for customer lunches; this does not mean that that the credit office should be any less aggressive in identifying potential bad debts. Customer delight can never be their culture or mantra. The same applies to an in-house quality assurance laboratory. For them it really doesn’t matter what the culture is. They must test to specification and fail products that do not meet it. It can be argued that this is ensuring customer delight, even if it means upsetting the customer. One of the most difficult aspects of changing the organisational culture is changing the lexicon of the company. Over time, the company builds up an internal vocabulary. The words people use provide direct insight into how they think. It is very difficult to convince anyone that the words you use do not reflect the way you think. Once can be a joke. Repeated use of words just becomes the way you think. Racial statements are an easy example. Said once, it can be a poor taste joke. Multiple times and you are a racist, even if you don’t admit it to yourself. Less easy examples are the use of words such as ‘Customer’ versus ‘Client’, ‘Locked in’ contracts versus ‘Termed’ agreements. These words can mean the same thing but using the right words and, importantly, no longer accepting words that do not reflect the new culture, is a significant step forward to embedding the new culture. Companies should want to sign their customers up to a term contract – this provides certainty of cash flow. They shouldn’t want tolock their clients in. It implies malice of forethought and behaviour. They don’t want staff thinking of ways to lock clients in; they want staff thinking of products that can be sold on term agreements. The principles are the same, but the mental framework is different. Often the public face of the company will use language such term contracts but privately they may discuss how they can launch products that will lock their customers in. To change the culture this private vocabulary must be stamped out. To summarise: to change the way people think, get them to change the way they speak. Once they think differently, then they will behave differently and the new culture will embed itself. It is quite likely that the staff will need some assurances that the new behaviour is acceptable. On this matter there is no better substitute for embedding the new culture than for the staff to see the senior executives walking the floors in a manner that exemplifies the new culture. Staff will see it’s acceptable and the new culture will start to take hold. I will close with the note that cultural change is not for the faint hearted. It can take years to complete and if a company does not have the stomach for driving change over a long period, then it is probably better not to start. Giving up halfway means you will have a new culture, but you won’t know what it is.